The last time that I introduced a psyllid or jumping plant louse in my post was in May 2017. However, my first experience with psyllid came from the very unusual hairy gall fig psyllid. The unusual part was the hidden nymph. It was enclosed in a hairy gall formed on the leaf of a fig tree. Each gall housed a single nymph. It took me a long time to solve the hairy gall mystery as I had zero awareness of psyllid back then. Recently, I had spotted another type of psyllid on the underside of the leaves of the uncommon Rough Trema (Trema tomentosa). The massive presence of the nymphs indicated that Rough Trema was the host plant. The nymphs lined up themselves along the main veins of the leaf. Their appearance looked similar to the Jackfruit Psyllid. The adult psyllid was orange in colour. Due to the minuscule size this bug and my often trembling hands, it took me a few trips over several months to the same location before acquiring some decent pictures. Fortunately, the population was quite resilient over time. They were being protected by the small Ghost Ants (Tapinoma melanocephalum). 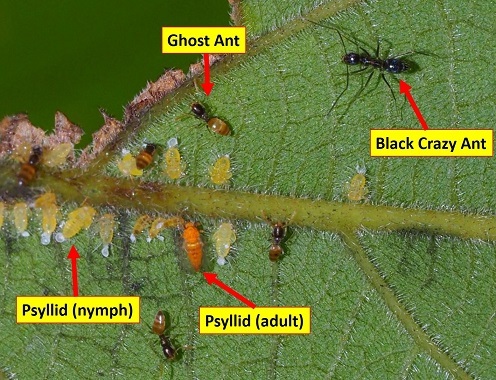 The sugary whitish substance at the distal end of the nymph's abdomen housed the secret recipe to the happy psyllid-ant relationship. The lone Rough Trema that hosted the psyllid was a young tree. It was overshadowed surrounding vegetation including climbers and was the only Rough Trema seen in that park. Time will tell whether it would eventually outdo the competition. 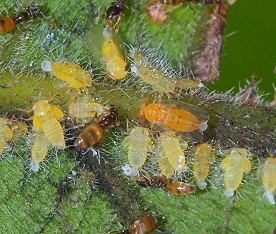 According to a 2002 report , Trema tomentosa was listed as one of the host plants of the psyllid, Paurocephala dayak found in Malaysia, Brunei and Singapore. Paurocephala dayak was described as having orange to brown coloured abdomen which fit quite well with the specimen that I saw in the field. Hence, this psyllid could be Paurocephala dayak.